Sidewalk Chic: Vintage scarf giveaway! I recently hit 200 posts, and felt like celebrating the milestone by giving back to my readers, since you all make blogging wonderful. 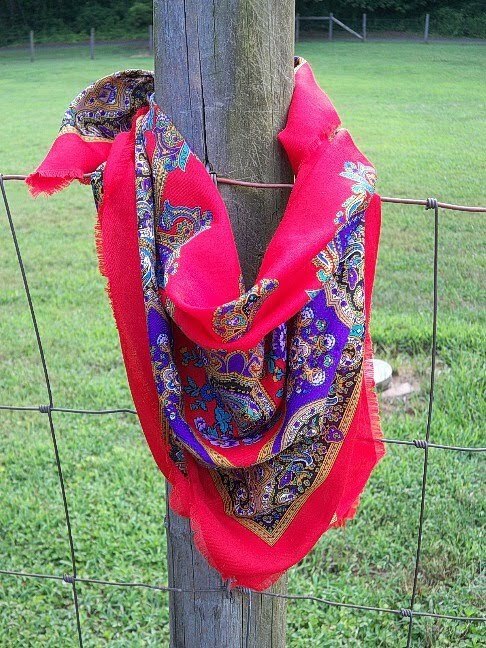 I had been debating what to do for a giveaway for awhile, and last week, while at a local vintage store, I found this vintage red paisley scarf that is almost identical to the one I've been sporting lately (this giveaway one has more gold tones than mine). It seemed too serendipitous a find to pass up. This scarf would be a beautiful item to add color to summer outfits, and you can style it in so many ways. 2) Leave a comment with a way to contact you and how you'd style it. This giveaway is open worldwide and will end Sunday, July 4th, at 11:59 p.m. EST. I'll draw the winner through random.org. To whoever wins, we can be scarf twins! I've been following since close to your 100th post! I love the bright rich colors! I would wear it as a turban or a head-band with a black outfit and black high heels. Congrats! I love the scarf and would wear it rosie the riveter style with some cut-off jean shorts and a simple, white tank with tan, rope wedges for a little vintage charm. Hope you have a great week! congrats to 200 followers! i have been loving the way you have been wearing your scarf so i think i would do a lot of copying! I'd style this with a cute asymmetrical top, a mini dot bubble skirt, and a pair of ankle cowboy boots! I would wear this scarf with skinny jeans and some bangles. congratulations! i have been loving how you wear your scarf but i have really liked how second skin has been wearing scarves as shirts! so i would give that a try! I would wear the scarf with my spring/summer coat - my daughter would love to play with it while I am wearing it. I'd love to wear it with my black dress that I have! Hi! I am following your blog via gfc!!! Your pretty and vintage scarf would be so nice accessory in my wardrobe!!! Awesome!! I follow with Google Reader! I love that scarf, and I'd totally rock it with simple darkwash jeans and a white tee. I follow you through google friends. I would style the scarf around my neck. Yay for you Hun!!! It's a big thing in blog land... Meanwhile look at your blog... Adorable!! I am big fan of refashioning so it may end up being several purses... You never really know!! Congratulations on 200 posts! I am a follower of your blog and have been for awhile. You'r outfits are just so well put together that I can't help but to look each week :) To style it, I would probably tie it around my waist like a belt. Probably paired with some black skinny jeans and a crisp white shirt. Or tie it around my neck with a black summer dress. So many options! I'm aching to try tying it around my waist gypsy style over a long sheath dress ... it could work. i'm a follower! i think i'd wear it with an all white dress...make it the star! and, if it would wrap around my waist, I'd pair it with a black jersey dress, some red beads and gold sandals. fresh and easy! I'd style it to spice up a boring work outfit! Wearing around my neck or maybve as a belt!! Congratulations on your milestone! I'm a new follower, and I'd wear the scarf with this cute white sundress I have - I think it would go wonderfully!